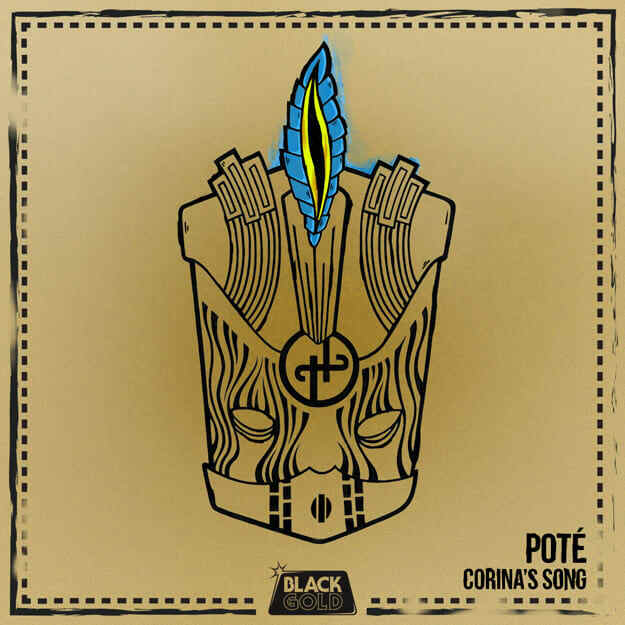 Poté Speaks on His Latest Single, "Corina's Song"
Born on the eastern shore of St. Lucia and presently residing in London in the UK, bass-rich producer Poté is a key player in the development of global bass&apos; most intriguing movement. But, with the release of "Corina&apos;s Song" today on Black Gold Records, he–similar to so many others in his creative circle–expands the thought process for fanatic followers of their progression from being more tropical bass-oriented to the idea that these are all flat-out great producers making some of the world&apos;s most intriguing sounds. I had the opportunity to chat with Poté regarding the release of his latest, jungle, drum and bass and break-beat driven production, as well as thoughts on dance music overall at the moment, his creative inspirations, and St. Lucia&apos;s love for of all things, country and western music. Where did the influence come from for "Corina&apos;s Song?" I didn&apos;t want people to see me as a tropical bass producer. I wanted to be seen as someone who just makes good music. I made that track two years ago after watching the opening for the Olympics, and I wanted to re-create a Breakage tune. That&apos;s why it has breaks and stuff in it. It didn&apos;t really work out. The main element I wanted to take from the Breakage stuff is that his more recent stuff has more of a trance-like element to it, , where he can repeat 16-bars of one thing, and you love it. That&apos;s what I tried to do with the synth bits, and with the rest of it, I went wild a bit. I wanted to take you back to when you first realized that music was "a thing" that you were into. Who was the artist or what was the song that made you decide to really get into music overall? [Rapper] Bow Wow. I can&apos;t remember my favorite song. I would have been really young then, but that was the first album my dad bought me. So, let&apos;s move from songs into production. There&apos;s always a moment when a music fan decides, "I want to know more, I want to know why the music sounds like it does?" When was that moment for you? Justice. Yeah, I watched the tour movie for A Cross The Universe and it was crazy. I listened to the album, too. How much distortion was used, how they disobeyed music laws that were there before, they did whatever they wanted. So, when did you actually start producing and what were you making? I started making tracks at the age of 15 or 16, maybe around 2009? I was trying to make electro back then. Trying to make more Justice-style stuff. Intriguing. So when did the crossover with your roots from St. Lucia take more form within the basis of your sound? That occurred two years ago. It was my dad&apos;s influence. I was making "dubsteppier" stuff, and my dad was trying to get me to listen to some of the more [roots-driven] stuff to influence my music. So, I thought I&apos;d try a few, and it ended up that I started making [more roots-tinged music]. Soca&apos;s actually one of my dad&apos;s favorite genres of music. He&apos;s always trying to pull me over and say "Listen to this, listen to this! You should make something that should sound like this!" He&apos;s always finding new stuff and sending it to me. Musical family? Or not so musical family? No, they&apos;re more into sports. My brother does athletics and my father use to be a football coach. I was a long-distance runner, but that got a bit tiring. Most Do Androids Dance readers know you from "Jabulu," from Enchufada&apos;s Upper Cuts Volume Three. How did that track come about for you? I made it a year ago. It had a completely different beat to it. He doesn&apos;t even speak Portuguese! We were messing about, went on Google, and we searched for the pronunciation of some of the words. I just pushed him into doing the vocals for the track, and I made a completely new beat because I didn&apos;t think the beat was strong enough. I sent it over to Branko, he liked it, and he wanted to do the Enchufada thing. "Corina&apos;s Song" is out with Black Gold Records, a label that you&apos;ve released a few tunes with in your career. How is that relationship evolving? It&apos;s going good, I like the team that I&apos;m working with there. They&apos;re allowing me the freedom to explore. So, I wanted to ask you about playing out in London these days. I get this feeling that pop/top-40 in the UK is very similar to what&apos;s happening in the U.S., which for DJ/producers always is an issue because what do you do as far as the music you&apos;re making if it isn&apos;t exactly what the mainstream is wanting to hear? It&apos;s very, very "housey" right now. It makes it a bit harder to play stuff outside of the box, because people will just leave. It&apos;s starting to get more diverse as people open up to different sounds, but still very "housey." I make whatever I want - I make a whole heap of it - and then I put some stuff to the side to release. So, in listening to a lot of your material, I get the sense that a lot of it would do well with vocalists. Who are vocalists and/or other producers that you&apos;re interested in potentially collaborating with? Breakage, Thom Yorke, and Jon Hopkins would be a collaboration, but Elephant Man. Wow. That would be a dream. Major Lazer would be a fun experience too, I&apos;d say. What are you listening to these days (outside of your own material? Jackson and His Computer Band, Jon Hopkins, Radiohead & a lot of techno. I&apos;m also listening to a lot of people around me. Castro, Mala Noche, just trying to get with people that are around me and hear what they are doing instead of going too far out. I&apos;m not a fan of listening to a lot of music, actually, to be completely honest. So, you&apos;ve mentioned Castro and Mala Noche, so I wanted to ask about the growing clique of progressive bass producers in Europe, including the three of you, as well as Branko, Buraka Som Sistema, King Kong and others. What&apos;s it like to be a member of this creative circle? I went to Red Bull Studios with Branko and Castro. I made so much music after that. It gave me the energy to make music again. And then I started talking to King Kong and Mala Noche. It feels like a little circle of people that I can send tunes to and get good and really honest feedback which I respect. And finally, St. Lucia. Have you been back home recently? I went two years ago. It was crazy. Most of it was seeing family. We live in a village on the east coast near the beach. There were a few parties, every Friday or Saturday on the road. Any designs on playing a set in St. Lucia? Ah! Yes! it would be the biggest thing ever! I was trying to persuade someone I knew from my childhood to let me go on the radio and do a guest mix. But when I listened to the radio, it&apos;s as it stuff really hasn&apos;t developed from when I was little [and living] there. Still the same old country and western. Country and western? In St. Lucia? So, the obvious follow up is, can we expect any Avicii-style country-soca productions from you especially meant for the crowd back home?